Come hiking with me as I have a great time in the beautiful nature God created by getting a good cardio workout in at the same time. I recorded my view of part of the Telegraph Pass Trail at South Mountain in Phoenix, AZ. It was so beautiful outside yesterday I had to be out in it after my Girevoy Sport practice. Remember as long as you are active every single day, in some capacity, that is what matters to make a difference in the way you feel, look, and in your overall well-being. I love hiking and Arizona is packed with great trails. I'm lucky to live very close to some of the Valley of the Sun's best ones. No matter what you do as long as you do something for no less than 30 minutes you will be well on your way to become as healthy as you can be. Just the mindset it takes to be pro-active and do something will be far greater than if you weren't. It will be a complete mind/body connection. The rest will be your spiritual and for me, being out in nature, really allows me to truly connect with God's beauty and awe. 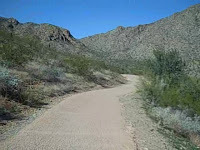 So take a quick journey with me- and breathe in the cool fresh air- sharing the awesomeness of the trees, cacti, desert trail, rocks, blue sky, and bright rays of sun. Sorry about the shakiness of the camera. The trail is pretty steep and I was moving at a really good pace. Next time I'll bring my good Sony video camera instead of the Flip Video cam. That way it will be much, much better quality. Anyway enjoy!